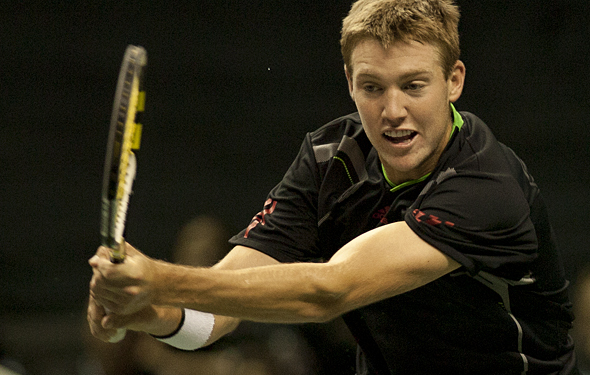 Jack Sock won his first ATP title. The young American males haven’t won a title in quite some time. But the 22-year-old Jack Sock is moving very fast, making progress in Indian Wells, Miami and now winning the U.S. Men’s Clay Court Championships in Houston, beating Sam Querrey 7-6 (7), 7-6 (2). Not only were many fans were surprised how good he was on the hard courts at Indian Wells and Miami To see the 22-year-old running back and forth on the clay, they were definitely surprised. Some of the players can’t handle sliding all day, but he actually likes it. The 22-year-old played OK last season, reaching the Challenger final in Savannah and he qualified at Nice, where he lost to John Isner. He did reach the third round at Roland Garros, going down to Dusan Lajovic. He wasn’t perfect and, as he admitted recently, he should have been in better shape. However, he kept plugging away, reaching the semifinal at Newport and Atlanta, before he skidded a bit, losing in the first round of the US Open. But he played well in the fall, upsetting Kei Nishikori in the Masters 1000 Shanghai and qualifying at the Masters 1000 Paris, where he almost beat Milos Raonic. This season, he missed the first two months due to an injury but when he came back at Indian Wells, he felt like he was faster and concentrating more. He reached the fourth round before falling to Roger Federer, and in Miami, he upset the No. 22 Fabio Fognini before going down in the third round. “This is the best I’ve felt physically by far off the court and on the court,” Sock said. He has a massive serve and a big forehand. He’s a fine volley but he knew in Houston that he had to be patient because on the clay courts, it takes time to set it up and then go for his shots. That is what he exactly did in U.S. Men’s Clay Court. He beat No. 15 Roberto Bautista Agut, No. 32 Santiago Giraldo and No. 16 Kevin Anderson before besting his fellow American Querrey. He beat a series of solid players and he never looked nervous at all. Sock has climbed to a career-high 36th and he is now the No. 2 American, behind Isner. Very likely, he will continue with rapid rate.